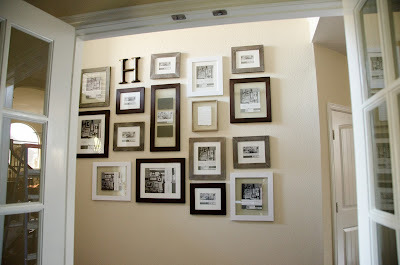 I have an open concept in my house so there aren't that many walls to hang pictures. 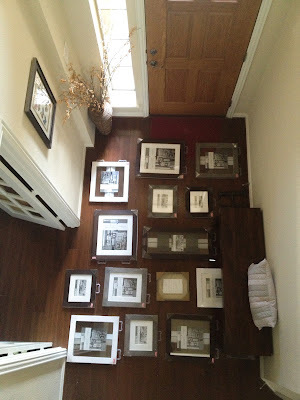 My foyer has a two story wall that I nailed some frames up when I first moved in. 8 years later and the same 6 posed baby and family pictures still hung. A lot has happened in 8 years, including me having more kids. The most recent family picture was missing my youngest child who is now 7 years old. I was so ready to take all the posed, Sunday dressed, fake smiles off my walls. 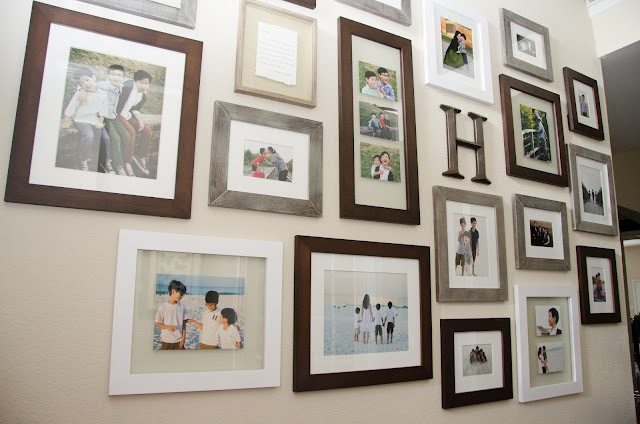 My wall was empty for a while because I couldn't find the frames at the price I wanted and since I was going for a less formal look, I wasn't going to reuse any of the black frames that I already had. That meant having dozens of black frames that I didn't need and having no frames that I did need. 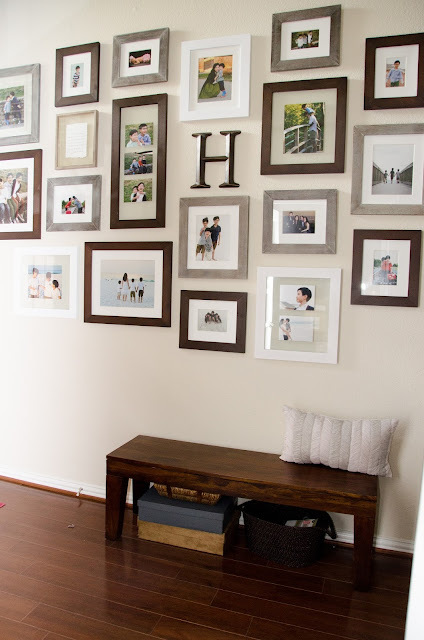 I was out of luck for weeks until I saw the triple picture frame on sale. That started my collection. I bought every size they had in the dark stain. 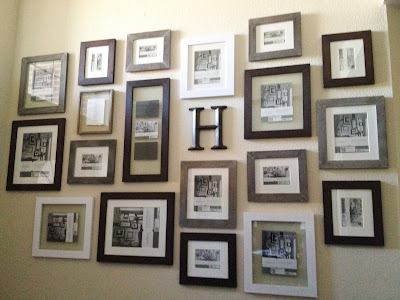 The following week, at another Target location, they had the grey and white frames on sale so I bought all that was on the shelf. I couldn't resist the 75% off price. In the end, I love love the mix and match of frames. It was exactly what I was looking for as well as exactly what I wanted to pay. This project took what seemed like forever. I first measured the wall to see how high and wide I wanted to go and decided the best place to start was to lay everything out on the floor. I went upstairs to view the entire layout. Once I was satisfied. 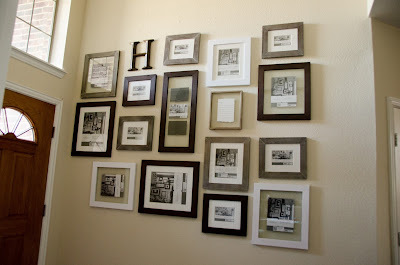 I started to hang the pictures, starting in the middle and working my way out. I came up with this. I stared at it for a while and stepped away. When I came back, I decided to tweak things a bit. With plaster (to fill in holes) in one hand and a hammer in the other, I started to create new holes, while filling in the old ones. This is what I came up with the 2nd go around with it. This time when I stepped away and came back, I still loved it. All in all, it took me nearly 4.5 hours to come up with the layout and hang everything. My framed space was 6 feet tall by 9 feet wide with the lowest bottom frame about 3 feet from the floor. It stayed this way for I would say 6 months because I was so busy. Yet, no one seemed to notice and I even had some comment on how great the pictures were. I don't know if they just didn't notice that all the pictures were exactly the same or that they were just being nice. When I finally had time, I went through thousands of pictures, copying my favorites into a separate folder. I knew which pictures I really loved, but I didn't know which size to order. I needed to visually see where everything would be to make sure I didn't have the same poses right next to each other. Therefore, I decided to create a template of my wall on the computer in order to better see what pictures would look good and where. 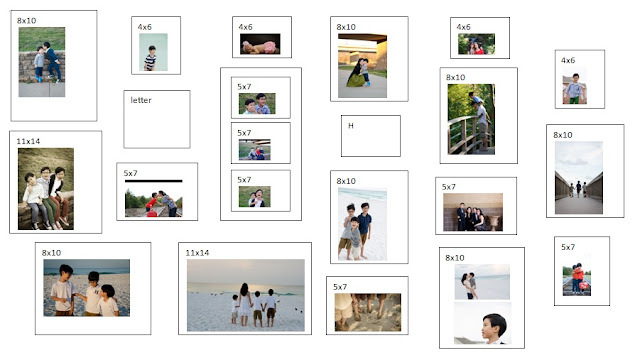 It was very easy to move images around on the computer and when it came time to ordering the prints, they were already marked on my template. This made ordering prints, quick and painless. Here's my final selection. All my images were taken by me except for the ones that I'm in. Each photo just makes me smile and it brought back a memory of the time that it was taken. That is what I wanted. I didn't want any photos that were taken in a studio with a fake background and forced smile. I wanted "family love" and I think I achieved that. There aren't any "say cheese" smiles. They are mostly of them running around and being silly. I love love love my wall of pictures. I love the frames. I love the pictures. I love the fact that it is the first thing I see when I walk in door and it is what I see when I sit in my office as I work so I am super happy. 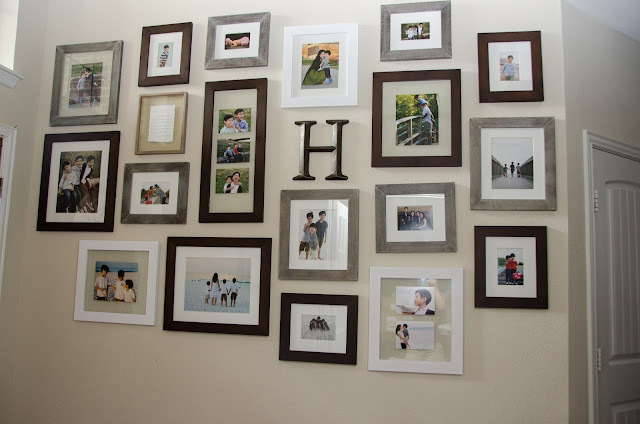 The total price was $75 for all the frames (which were originally $300, but I got 75% off) and approximately $25 for all the photos. Total amount spent was $100 for the entire project which is $50 under my budget so I am super happy about that. Sometimes, all you have to do is wait to get what you want at the price you want it. I'm so ecstatic I did just that..I waited and waited...and finally found what I was looking for.